In other words, the UAV can act as eyes and/or ears, among other things, for the user to extend the user’s perception. The UAV may be used, for example, to record information from a perspective different than the user’s perspective, scout dangerous situations, or locate/retrieve items for the user, among other possible tasks. In some examples, the UAV can be small enough to carry on the user’s person (e.g., in a bag, in a pocket, on a jacket, etc.) and allow for ready deployment. And then there’s the other use, as a mobile dash cam for law enforcement. 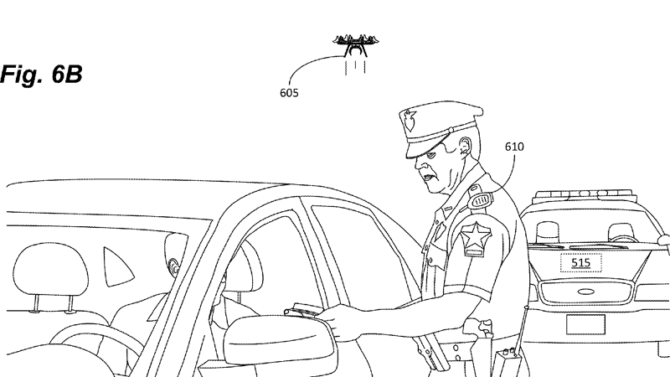 Perched on the officer’s shoulder, the drone would be ready at a moment’s notice to fly up and survey the scene. Or to allow the officer to safely see around corners, over walls, or behind other obstacles. And all available at the behest of a simple voice command. A personal drone sure would be handy. There are plenty of tiny drones out there already, but building in this kind of capability is going to take some work. Camera, voice processor, potentially GPS and other systems, all add up very quickly. But, if anybody can do it, Amazon stand a better chance than most with the resources and funds at their disposal. What surprises me most, though, is that Google didn’t think of something like this first. Especially given the obvious potential for connecting to Android devices. Using the phone to process voice commands, store video, and issuing simple movement instructions would take a lot of potential weight away from the drone. One of the other scenarios mentioned in the patent is traffic jams. A user sitting in traffic may not be able to see what is causing a slow-down. If, for example, the accident is nearby, it may be advantageous to just wait and stay on the highway. If, on the other hand, traffic extends as far as the UAV can see, even from a high perspective, then it may be advantageous to exit the highway and take surface streets. In this case, the hover command can enable the user to see how far traffic extends and make an informed decision. Even in a situation where traffic is stopped, I’m not sure how sensible it’d be to send a drone out of the window. If traffic starts moving again before the drone gets back, it’s unlikely to be able to catch up. And it’s not like you can just sit there holding up the traffic even longer while waiting for it to come back. Given Hollywood’s recent pattern of re-releases and sequels lately, I wouldn’t be too surprised if a remake of this one came up on Amazon Prime sometime soon. 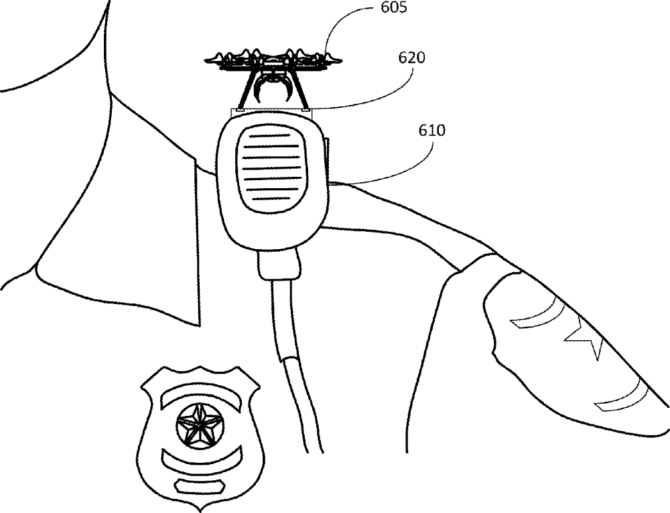 You can read the full patent here to see some of the other ideas that Amazon have come up. I kinda like the idea of drones becoming something more useful than just a toy or a filming tool. If nothing else, if this comes to reality, perhaps it’ll make drones a little less scary and more accepted by the general public. What do you think? Are “personal drones” going to start making a useful impact in our daily lives? Is this a good thing or bad? Is this a patent for the sake of owning the idea and we’re still years away from getting the technology so small and light? Let us know in the comments.